SocioPoetix – What is SocioPoetix? The term socio-poetics most generally refers to works of art seeking to heighten awareness or create social change within a particular context, rather than a work existing within or simply commenting on a social context. 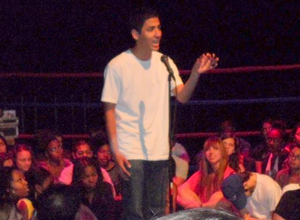 The art of spoken word poetry is inherently linked to this same process of social change, awareness, or problematization. Therefore, SocioPoetix offers spoken word poetry as a strategic pedagogical medium to incorporate socio-poetics into the academic discourse of sociology. By intertwining both of these mediums of instruction, we believe we can educate a broader following of both students and audiences with not only a rational understanding these issues can have on society as a whole but also an emotional understanding of the devastating effects these issues can have on people as individuals.